If you will be in the San Diego area for New Year's, love graff art and want some of the masters in the game to give you a tip or two, then you should attend this workshop! 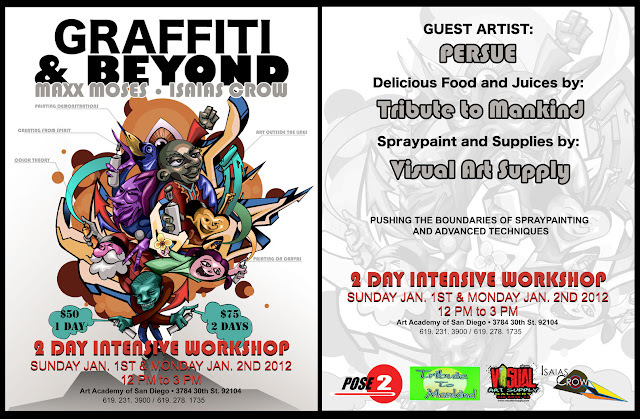 Maxx Moses and Isaias Crow will be having their second annual two day intensive "Graffiti & Beyond" workshop at The Art Academy in North Park. Tribute to Mankind will have a their delicious juices and food available at a discounted price to participating students. Visual Art Supply will be in the house with Spray-Paint, Caps, and all other goodies you'll need for the class. Sign up to join the class as Maxx Moses and Isaias Crow share the many branches graffiti art has and offers. spray-paint techniques and masters secrets of the graffiti art form and so much more!